There is a risk that the mullion becomes 'live' due to a defect in the mullion heater wire and earth bond connection. There is a possibility that a user may receive an electric shock if the user makes contact with a defective centre mullion which is not properly earthed. 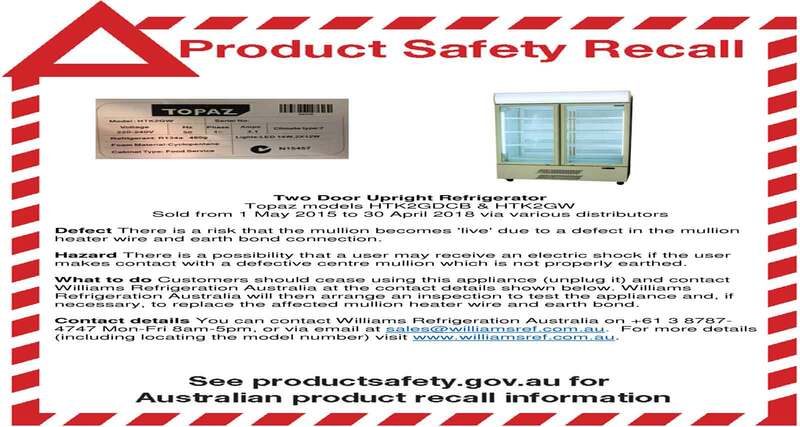 Customers should cease using this appliance (unplug it) and contact Williams Refrigeration Australia at the contact details shown below. Williams Refrigeration Australia will then arrange an inspection to test the appliance and, if necessary, to replace the affected mullion heater wire and earth bond. You can contact Williams Refrigeration Australia on +61 3 8787- 4747 Mon-Fri 8am-5pm, or via email at sales@williamsref.com.au. For more details (including locating the model number) visit www.williamsref.com.au.